In the first half of the 19th century Galena was a booming town while Chicago was still a swamp (1850 population was 14,000). The growing river boat commerce on the Mississippi and the discovery of rich deposits of lead ore in the region made this a major Mississippi River port - at one time the busiest between St. Louis and St. Paul. The town attracted settlers, entrepreneurs, speculators, and empire builders. Many lavish homes and places of business were constructed from 1820 - 1860, during the zenith of the town's growth, and continued through the end of the century. An unusual number of these 19th century structures survive to today, contributing to popularity of the city as a tourist destination. 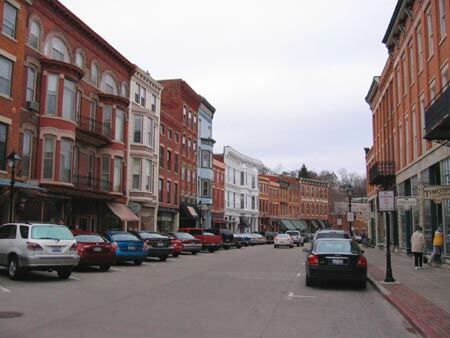 Galena is actually located on the Galena River, a few miles upstream from the confluence with the Mississippi. At one time the river here was 300 feet wide allowing the largest of the Mississippi river boats to come upstream and dock at Galena. Over the years due to erosion from agricultural land clearing, grazing and from numerous abandoned mine operations brought tons of silt into the river, reducing both its depth and width . . . and its viability as a major river port. At the same time railroads constructed next to the river were taking over passenger and freight transport. Galena was not on the main line, while some time between 1886 and 1990 the Burlington Railroad built a stub to Galena. These changes played a key role in the town's decline as a major economic power in the region. Yet the retail and hospitality base that had been established during its heyday managed to endure and with an influx of artisan's enabled many of the old homes and structures of commerce to survive to today. We first visited the town in the middle of winter. For a town of less than 3500 population, we were astounded at the size of the downtown shopping area - as well as impressed with the extent of historical preservation and restoration. 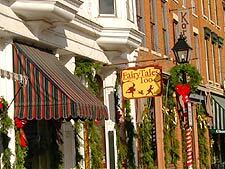 Go here for some pictures of downtown Galena's historic district.